Is the lazy landlord getting too lazy??? ForumsArrowLandlord Forums & Rental Property QuestionsArrowIs the lazy landlord getting too lazy??? It's time for another addition to the Lazy Landlord series. I am currently doing three simultaneous renovations. It probably would have been better to do one at a time . But three simultaneous vacancies sort of pushed me to get them all done as soon as possible. Being the lazy landlord that I am I decided to farm out 90% of this work . The other who was fast and reasonable but not detailed and left a little to be desired. One of the first things that I learned about doing such large scale renovations is that it seems to be better to pay for the various jobs separately. Contractors seem to like to choose which jobs they tackle on their time line and according to how they feel. By you segmenting the job you control which items get done first and you can monitor the craftsmanship and attention to detail of the work completed. You learn which contractors to use where in the future. I really thought that I was going to tackle all of the painting but I have decided to farm the painting out as well. Is this being too lazy? But I am talking about the entire interior of two houses and one apartment. I like to do my own painting also, but it depends on your budget and timeline to get a renter in there. What would you pay yourself to do it? Is it worth your time to be inside painting by yourself for a week or two straight? I might hang a curtain rod. Everything else is hired. I'm now learning, if its going to take me 3 months to do it all my self, thats about $3500 lost from it being vacant.. so i may as well spend that amount to have it done in 1 month have it rented sooner, sooner money is in my pocket, and i didnt need to do anything and can spend time with my family. Only kicker is having the funds to do so. My Lord! I'm surprised you spent the energy to write this update! Lazy is as lazy does! Your laziness is bringing out the worst in your business expenses: in others words, you are paying for things that a) don't need to be done-like excessive painting, or b) could and should be done by a landlord having just a touch of gumption. Let me know if you need me to type your response for you! I'll send you a quote for the work! The first where I painted one of the same houses that I am now considering farming out. The lazy in lazy landlord is tongue in cheek. My apartments usually are the best in town for the money. By the way I did the floors. Yeah, well some of us would rather do a little work and do it right rather than schedule, wait, correct , then stroke a huge check for the privilege. Armchair landlording lol. Your returns must be off the charts, Christine. I hear ya with painting quotes, bud. I could have a room done by the time they finally come over and I'm done flopping on the floor from their 4-figure quotes when they so. I have had good luck hiring a $12/hr guy to roll. I have a hand-trained guy that can do both for $15. I'd get a helper either way, especially with multiple units open. Time is $! I've never run into any other posts from this series, but I love the concept. I used to do a lot of the work myself, and now that I quit my W-2 job, I'm still doing some myself, but I'm becoming more and more cognizant of how expensive it is to do your own work. It takes twice as long, is half as good, and the material cost is about 20% higher. I'll continue to do some of the work myself because I enjoy it and I think the education is helpful for future decision-making, but I'm aware that it's an expensive hobby to do my own work. Continue writing these, and I'll start reading them. Painting of course is something we all can do and we can learn some tricks to help us get a professional job. Excuse me for wasting your time reading my post to you about wasting time! Won't happen again. I thought this was a blog for people who seriously wanted help from others; I didn't know it was The Comedy Store. You are or run a professional painting crew. As a "Land Lord' I guess you have the option to do what you want it's your money. Lazy is not paying attention to your investment in my opinion. Personally I'm not lazy I don't understand the concept. I do understand how to maximize time, money, and effort to turn a unit, get the best possible market, income and keep my investment profitable, and my head above water so I can relax..sure I do some things myself and other things I hire out and it's seemed to work for the past 40 years so I guess I'm doing something right. Just because I personally don't cut the grass, plow the parking lots, put the shingles on, doesn't make me lazy, I've decided it's in my best "pocket book" interest to have it done by someone else. My talents also are having a good pool of people to choose from to call for work that needs to be done, knowing they will complete the job at a fair price. They appreciate me as owner, Land Lord because I pay them promptly. I pick the battles I can win, do some of the work myself and hire the rest. I do understand how to enjoy my money. you just captured lazy landlord concept in a very serious no nonsense refuse to laugh at myself way. @ Steven Maduro, I told you long time ago: you should have bought a stick-shift wagon! did the competition managed to match your level of renovation/design? "You do you do by far it is the fairest in all the land"
In fact I just recently remodeled an apartment and it had lots of bells and whistles. But the good really overwhelmingly outweighed the bad. She certainly kept me on my toes. The big boy company said 5 grand if it's outside the foundation line, after the leak tester guy came and listened to the line. They said try and pin point the leak and suggested we start to hand dig as it was right next to edge of foundation slab. If leak wasn't on outside we were told we'd have to tear slab up on inside to get to pipe. So I hired a couple of guys to start digging. They decided to take a break, so they left and went into the house for some coffee. I felt like digging,it's simple, I could do it, I had been wheelbarrow person up to this point.. and directing them. 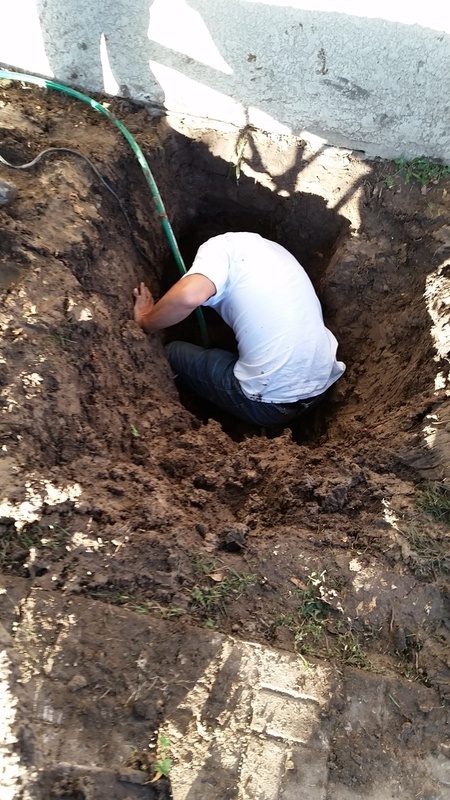 Well I fell in the hole,, yup up to my shoulders after the shovel slipped out from under me when I hit a rock. I was covered with mud and I scrapped my face and was embarrassed to say the least. I was stuck and couldn't get out, I was so embarrassed I didn't want to scream for help and have them find me like a pretzel in this hole. Well, I wriggled myself out and learned a lesson, I realized It wasn't my type of work to do. I knew this from the beginning and why I doubted myself, it was just plain stupid. I couldn't cry all I could do was laugh and be thankful I wasn't hurt worse. So Ya I can laugh at myself and along with others, they sure laughed at me covered with muck when they found me. They found the leak at the coupling, big boy company finished the job. And I hired someone to fill it in. Not sure what i would call it. I like you already: "When life trows you lemons, make lemonade"
When the scrapes come off may i recommend a good nice-smelly long hot bath? and a banner on the wall/fridge: "DO NOT TOUCH A SHOVEL!"